Yutaka Kono wears many hats in Vermont's music community. He's artistic director of the Burlington Chamber Orchestra (read more about that) and conductor of the Vermont Youth Philharmonia, as well as director of orchestra and associate professor of music at the University of Vermont. Kono's résumé is flush with other prestigious credits, such as stints with Texas-based symphony orchestras in Victoria, Austin and Corpus Christi. He received his doctorate in musical arts at the University of Texas at Austin. Kono's instrument: the tuba. 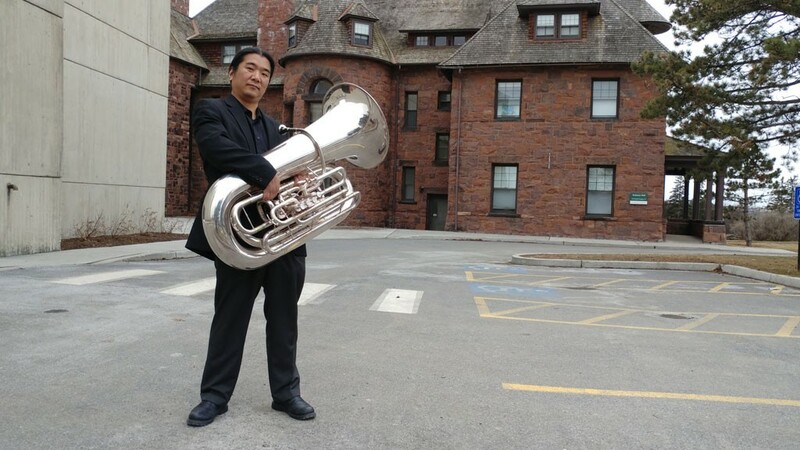 Although many universities and conservatories offer a DMA in tuba performance, Kono was a pioneer at his alma mater. In 2002, he was the first to take the bulbous, brass instrument all the way to the doctoral level. The professor has played in Dixieland, rock and klezmer bands as well as classical ensembles. He instructs scores of students on campus but currently has only a few private tuba students. Seven Days recently caught up with the professor to learn more about his underappreciated instrument. SEVEN DAYS: What originally attracted you to the tuba? YUTAKA KONO: Well, first I wasn't. I wanted to play the French horn, [but] I couldn't play as well as the rest of the students in the band. I was really getting behind. And one day, the band director told me, "Why don't you just play the tuba?" Things went well, and after that he didn't let me switch back to the horn. I was stuck with the tuba. But then I started to discover the joy of that instrument. SD: What about it brings you the most joy? YK: Especially now, [it's] the ample amount of music and different genres that I can play in. When I started, I wanted to become a professional orchestra player, but, going along, I discovered chamber music. SD: How is playing tuba different from playing other brass instruments? YK: Well, it takes a lot more air — being able to increase lung capacity to be able to use air efficiently becomes a big part of playing the instrument. The amount of air can influence the tone quality, range and other elements. SD: What's the hardest thing for a first-time tuba student to master? YK: Because of how we produce sound, it takes a long time to be able to play a tune on the tuba. For [the] first lessons, you have to work on how to produce one or two sounds. Just changing the pitch is really difficult in the beginning. A lot of students get discouraged because they can't produce enough pitches to play any tunes. If you can play three or four notes [on] your very first [try], that's great. On the piano, you can play all 88 notes without even taking a lesson. But it's not like that with a brass instrument. To be able to have a range of one octave, [it takes] my students at least six months of consistent playing. SD: What's a common misconception about playing the tuba? YK: A lot of people think we just play two notes. There's a joke: A student takes [his first] lesson [and says], "Hey, Dad! I can play one note!" And the next day, "Hey, Dad! I learned to play two notes!" And the third day, he never came home. His dad asks him where he was. He says, "I had a gig!" But that's not the case. If you look at a piano, [a tuba] can cover from below the lowest note to higher than middle C. So, we have a wide range. And, also, it is difficult to play fast on the tuba because of [its] size and range. SD: Are any composers known for giving a lot of love to the tuba? YK: A really famous one is John Williams. In [Return of the Jedi, with] Jabba the Hutt — the background [in one scene] is a whole tuba solo. And [Williams] did write a concerto for tuba and orchestra. That was in the '80s, and it became a staple of the tuba repertoire. Recently — like, in the '70s and '80s — more composers [were] starting to notice that it's an instrument they can write music for. And since we don't have as many pieces to choose from, we tend to love them all. We treasure them. YK: That's the funny thing — I [generally] don't write for the tuba. I write for everything else. The original print version of this article was headlined "Brass Tacks"